The recipient of six starred reviews and the APALA Asian/Pacific American Award for Literature! Named a Best Book of 2018 by the Wall Street Journal, NPR, Smithsonian, Kirkus Reviews, School Library Journal, Booklist, the Bulletin of the Center for Children's Books, BookRiot, the New York Public Library, the Chicago Public Library-and many more! Minh Lê is a writer but, like his grandfather, is a man of few words. He is a national early childhood policy expert, author of Let Me Finish! (illustrated by Isabel Roxas), and has written for the New York Times, the Horn Book, and the Huffington Post. A first-generation Vietnamese-American, he went to Dartmouth College and has a master's in education from Harvard University. Outside of spending time with his beautiful wife and sons in their home near Washington, DC, Minh's favorite place to be is in the middle of a good book. 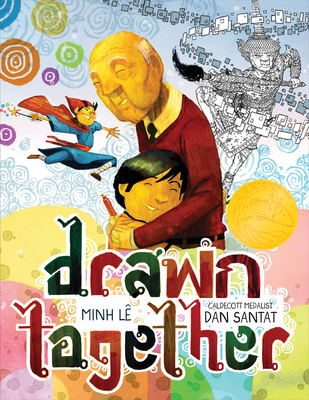 Visit Minh online at minhlebooks.com or on Twitter @bottomshelfbks. Dan Santat is the author and illustrator of the Caldecott Award-winning The Adventures of Beekle: The Unimaginary Friend, as well as The Cookie Fiasco, After the Fall, and others. He is also the creator of Disney's animated hit, The Replacements. Dan lives in Southern California with his wife, two kids, and a menagerie of pets. Visit him at dantat.com. PRAISE FOR LET ME FINISH!